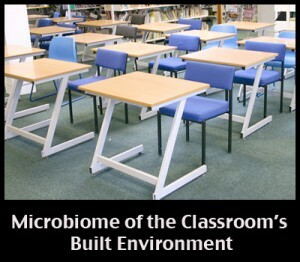 home News Microbiome of the classroom: Teaching? Not really. Learning? Yes, definitely. On March 7, 2014, Ben Johnson wrote an all-encompassing blog post about the microbiome of the classroom’s built environment. (Dr. Jonathan Eisen also mentions Johnson’s article in a blog post a day afterwards.) In his blog post, not only does Johnson describe the different types of microbes living on the walls, desks, and chairs in the classroom, but he also uses this as an opportunity to provide a general overview of the current research about the microbial built environment. He mentions specific built environments such as spacecraft and hospital clean rooms and Jessica Green’s ideas for amalgamating architecture and microbiology, but most importantly, he highlights the bright future of studying the diverse microbes living in the context of our just-as-diverse built environments. Ruth Lee is an undergraduate in Dr. Jonathan Eisen’s lab who is currently working on Project MERCURRI.